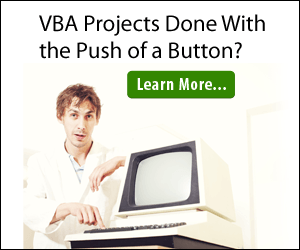 In this example we will see how to use the ActiveCell property of VBA. The ActiveCell property returns a Range object of the active cell in the active workbook. You can then apply any of the properties or methods of a Range object to it. Though you may find a very practical scenarios to use ActiveCell, it is best to avoid using it as much as possible. The reason being, if you accidentally change the active cell during the execution of the macro or you happen to open / activate another workbook, it will cause run-time errors in your code. So, in this article, I will also suggest few ways to avoid the use of ActiveCell and also how to minimize some errors that can result from using ActiveCell. Before looking at a practical example, let us have a look at a few examples on how to use the ActiveCell property and the various methods / properties associated with it. However, please note that if another workbook is active, the ActiveCell from that workbook will be considered, irrespective of workbook in which the code is written. So, always make sure to activate the current workbook before using ActiveCell. And for row and column, the respective numbers will be displayed. Consider the below snapshot. The ActiveCell is in the first column. 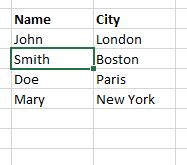 If you want to select the last cell that has data in this active column, you can use the code snippet below. The CurrentRegion property returns a range of cells bounded by blank rows and columns. In the following example, the selection is expanded to include the cells adjoining the active cell that contain data and the background color of the current region is modified. The entire range is copied to another sheet at the same location. The current region can be useful when the range of data is not fixed and you need to perform certain operations on it, like format it, copy it, insert charts or send an email using that range. Now let us look at a more practical example of using ActiveCell. 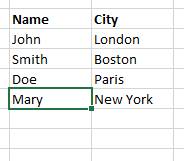 Say, in your Excel sheet you have multiple lines of data as shown below and you need to process data only for a single selected row. The desired output is that in the column “Gaining”, Y or N should be inputted based on the price level and the background color should be set to Green or Red respectively. You can easily avoid the use of ActiveCell here, by using the input box to get the stock name / row number from the user. After running the code on the last row the output will look like this.